The end of his goalscoring drought was practically inevitable. Robert Lewandowski had not scored more against any other Bundesliga side than FC Augsburg. 11 goals in ten games was his proud record – prior to Saturday's meeting between the Bavarian antagonists. 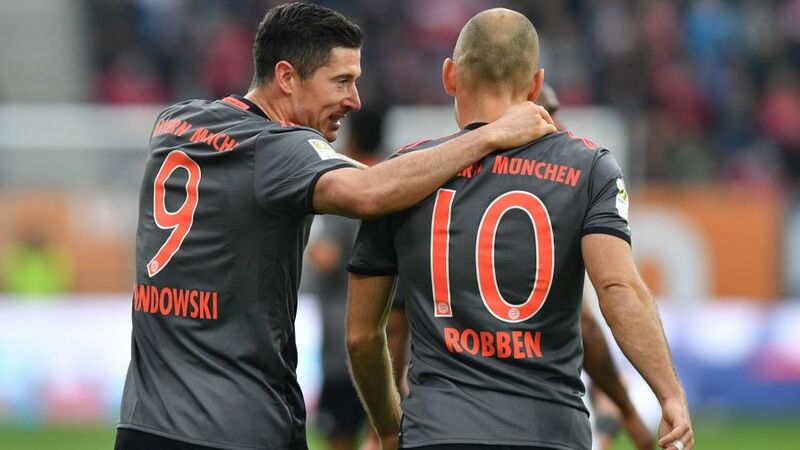 His 11th meeting with Augsburg brought two more goals, thanks in no small way to the preparatory work of Arjen Robben, who seems to have become Lewandowski's latest congenial partner in crime. "I'm really delighted that we've combined so well in many situations," said Lewandowski after the 3-1 win on Matchday 9. Before kick-off, he had taken Robben to one side to discuss how they could further refine their understanding. It worked. Relief at scoring was clear to see on Lewandowski's face. "I felt really good, which is why I also played really well," said the 28-year-old, who ended a drought of 480 Bundesliga minutes without a goal – an eternity for a player of Lewandowski's calibre, and his longest goalless streak in a Bayern shirt. "I know a time would come when I wouldn't score, but I kept my cool," he explained. Fantasy: Sign Lewandowski and Robben up for your Fantasy team here! "Lewandowski's a great forward," added Mats Hummels. "He works really hard for us and we're delighted he's scored again. It's really important for us that he's putting the ball in, and it's important for him too." Lewandowski's sixth and seventh goals of the campaign have also put him back in the hunt for the Torjägerkanone, which he won last term having netted 12 already at the same stage of the 2015/16 season. With 41 shots on goal, he remains the most trigger-happy player in the Bundesliga, yet only one in six has found the back of the net – a ratio he needs to sharpen if he is to defend his scoring crown. He did net his 32nd Bundesliga brace in Augsburg, though, and only eight players have done that more often. "It's good that he's scored here, to get back into shape in time for some important games," said Rummenigge, who will be hoping Bayern can seal their passage to the knockout stages of the UEFA Champions League with victory at PSV Eindhoven on Tuesday. TSG 1899 Hoffenheim visit the Allianz Arena on Matchday 10, before Bayern head to the SIGNAL IDUNA Park for the latest edition of Der Klassiker against Borussia Dortmund.